It�s about 5 degrees outside, the Eberspacher is purring away, and Bosun & I are cuddling in the saloon after a beautiful Christmassy walk along the marina boardwalk. Now, Bosun isn�t an actual Bosun � much to my disapproval of his blatant disregard for his namesake � he�s a dog. A little Jack Russell crossed, I think, with a bit of corgi. Bosun has lived with me on Milestone since I adopted him from a rescue society in March 2011, and he�s probably about 8 years old now. He happily hops on and off the boat himself, likes to sunbathe on deck, and even has his own lifejacket for sailing adventures � although he�s the first to admit, he�s a fair-weather sailor: two piles of puke and the same again in poo on a recent particularly �lively� voyage serves as evidence. Otherwise, he has taken to boat life remarkably well. When I first got him, he tended to accidentally fall in the marina about once every six weeks; he can definitely swim! Now it�s winter again, and he loves to curl up with me in the saloon and bury himself under his blanket when it gets cold at night. It can be too easy to take the things we love most in our lives for granted, so last week I decided to create Bosun his own page on Facebook. Now, I must admit, I work with social media on a daily basis in my professional life, so networks like Facebook are second-nature to me. Even so, it�s been a while since I created a Page from scratch; I�m used to working on client pages who already have some fans and a customer database to target. So Bosun�s page was going to be a challenge. Normally, your average Joe Bloggs with their own Facebook page � maybe they�re a photographer, make-up artist or singer � might attract around 500 fans if they put a lot of effort into building awareness and engagement over a good few months. So I was pretty impressed when Bosun managed to gain almost 900 likes on his page in one week! I spent just under �20 on some targeted Facebook adverts � selecting people who like boats, and people who like dogs to see the ads about his page � but other than that, the page has attracted its fans because its simply such a strong story. 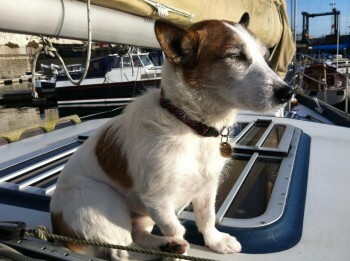 It seems that nobody can resist a cute little dog that lives on a boat.